Joanne Stevens (second from right) won bronze in the +70 women's foil event. Photo Credit: Trifiletti / Bizzi. 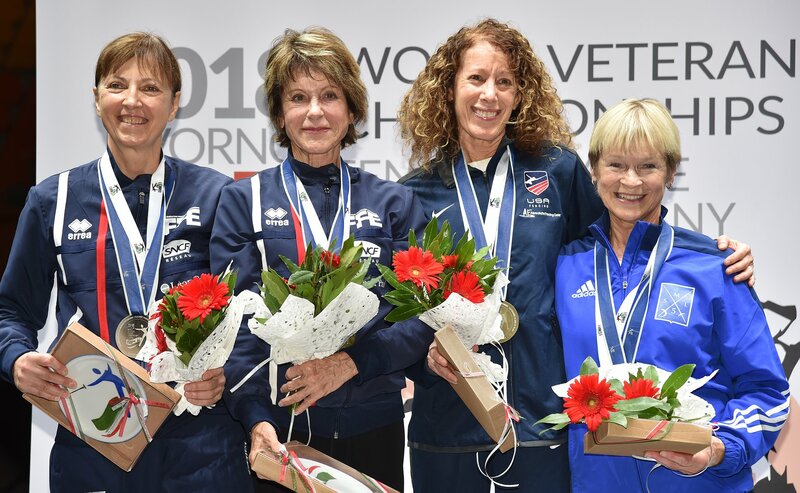 (Colorado Springs, Colo.) – Team USA is bringing home another two medals from the Veteran World Championships in Livorno, Italy on Thursday as Misha Mironovas (Columbus, Ohio) and Joanne Stevens (New York, N.Y.) each won bronze on the third day of competition. Earning their first career medals at Vet Worlds, Mironovas earned a podium finish in men’s saber in his first year eligible to compete at Vet Worlds while Stevens is competing at the tournament for the first time since 2012. This marks her first year in the +70 women’s foil event. Mironovas went 4-1 on the day, beginning with a dominating 10-1 effort over Michael Thomas (GBR). To reach the quarter-finals, Mironovas needed to clutch performances, outtouching Andrey Kobyakov (GER) and Stefano Lanciotti (ITA) by 10-9 scores. In the quarters, Mironovas fenced one of his teammates, overcoming Dmitri Kopylov (Roseland, N.J.), 10-3. He then came close to taking a spot in the final, but came up shy, 10-8, against Filippo Carlucci (ITA), who medaled at Vet Worlds for the second straight year. Kopylov, a seven-time team member, was perfect in pools at 5-0 before besting Tadayoshi Kato (JPN), 10-7, and Mike Krasnich (CAN), 10-8. Kopylov then advanced to the quarters to face Mironovas with a 10-6 win over Didier Asselin (FRA). After two-time individual Vet World medalist Bill Becker (Saint Augustine, Fla.) outtouched Robert Penton (GBR), 10-9, he dropped his table of 32 bout to Harmut Wrase (GER), 10-6. Competing at his second Vet Worlds, Ron Thornton (Fredericksburg, Va.) came up on the losing side of a 10-9 bout, falling to Ale Pimenau (NED), 10-9. En route to her bronze medal, Stevens controlled her table of 32 bout against her teammate Diane Reckling (White Plains, N.Y.), 10-1. She secured a medal with 10-7 and 10-8 victories over Nadejda Arskaya (RUS) and fellow American Linda Nowell (El Sobrante, Calif.), respectively, but lost in the semis to Antoinette Willard (FRA), 10-7. Back at Vet Worlds for the first time in 10 years when she won silver in saber in 2008, Nowell didn’t miss a beat in the 32, blazing past Heidrun West (GER), 10-1. In the 16, she edged out Brigitte Greuke (GER), 7-5, before falling to Stevens. Gemin Channing (Frederick, Md.) also competed, but stumbled against Marie-Josephe Lepeltier (FRA) in the 32, 10-3. In the 50-59 women’s foil competition, Jane Carter (Bedford, Mass.) and Lynn Botelho (Indiana, Pa.) took top-eight results. The silver medalist at least year’s Vet Worlds, Carter had her eyes set on gold. She earned the No. 1 seed out of pools with a 6-0 record, moving directly into the table of 32. Her momentum continued in the 32 as she easily defeated Kate Morwell-Neave (GBR), 10-3. In the 16, Carter faced teammate Margaret Fagan (New York, N.Y.), who had momentum of her own with two 10-3 wins against Harriet Jordan (AUS) and Eniko Palotai (HUN). Both members of last year’s gold medal winning team, Carter won the bout, 10-5, but in the quarter-finals, saw her day come to an end with a 10-8 loss to Anait Shaginyan (RUS). Botelho also earned a bye to the 32, where she posted a 10-8 victory over Marion Degenkolb (GER). After overpowering Galina Safronova (RUS), 10-5, the individual bronze medalist in 2016 fell to Stéfanie Reese (GER), 10-6, one win shy of a medal. Team USA’s fourth fencer in the event, Georgina Love (Ft Pierce, Fla.), cruised past Enza Saracino (ITA), 10-2, in the table of 64, but lost in the 32 to to Silke Weltzien (GER), 10-4. Seeing a U.S. fencer on the podium in women’s 60-69 foil has been nearly automatic in the last several years as Team USA’s lineup of Jennette Starks-Faulkner (Middletown, Conn.), Anne-Marie Walters (Parkland, Fla.) and Jude Offerle (Winnetka, Ill.) own a combined 15 individual Vet World women’s foil medals. However, on Thursday, Team USA would have to settle for top-16 finishes from Starks-Faulkner and Walters. A 12-time Vet World Team member, Starks-Faulkner looked poised for another podium finish, claiming the No. 1 seed out of pools with a 6-0 record and +26 indicator. With a bye into the 32, she quickly moved into the 16 with a 10-3 victory over Yoriko Yamada (JPN). However, in the 32, Starks-Faulkner faced another fencer who had a medal streak to defend as Astrid Kircheis (GER) entered the event having won a medal at the last three Vet Worlds, and Starks-Faulkner dropped the bout, 10-6. Thirteen-time Team member Walters also cruised into the 16, taking a 10-2 victory over Claire Martinot (FRA), in the 32. However, tied at seven in the 16, Gianna Cirillo (ITA) earned the winning touch over Walters, 8-7. Offerle will leave Italy with a top-32 result as she lost to Brigitte Delacour (FRA), 10-2. Suzanne Marx (Portland, Ore.) came one point from advancing to the 16, but was eliminated by Kaoru Amari (JPN), 3-2. The men’s foil team event also took place Thursday with Team USA finishing fourth. The U.S. was represented by this year’s bronze medalist Jan Patterson (Seattle, Wash.) and Rinaldo Campana (McLean, Va.) in +70, Henri Darricau (Highland Rach, Colo.) and Joseph Streb (Columbus, Ohio) in 60-69, and Don Davis (Patomac, Md.) and Alan Chernomashentsev (Jacksonville, Fla.) in 50-59. The team went 3-0 in pools, defeating France, Hungary and Australia to earn the No. 2 seed and a bye into the quarter-finals. Advancing to the medal rounds with a second win over Hungary, 30-13, Team USA lost to Great Britain in the semis, 30-22. In the bronze medal match, Team USA faced Japan, and came up short, 30-25.